Do you like to measure your marketing efforts and results? Then you need to be using UTM tracking! A UTM (Urchin Tracking Module) code is a snippet of text that is attached to the end of a URL in order to track source, medium and campaign name of your marketing efforts within Analytics (and other analytics tools). Below is an example of a UTM tagged URL. This helps you track the performance of all of your efforts and allows you to see specifically where your traffic is coming from. When to use UTM tracking? Track social media efforts. We absolutely recommend that paid social efforts be tagged with UTM parameters to allow you to understand how your paid social campaigns are performing on site, which ads and campaigns are performing best which helps you better optimize your efforts. Organic social links can be tagged as well if you would like to track on-site performance of specific posts. You should also use UTM tracking in your newsletters. You can tag all of the links in your newsletters using the same source, medium and campaign, but use the content parameter to differentiate the links in the newsletter. This allows you to see which links were most appealing, and what content resonated best with the audience. You can also use UTM parameters in your email signature to track visitors coming back to your site from any email. Banner ads and ads outside of Google AdWords should be tagged. Google AdWords will automatically tag your campaigns, but if you have additional digital efforts outside of Google, using UTM parameters will help you understand the performance of these placements and creatives in order to understand campaign performance and inform future placement decisions. If you create or share content with other digital properties (syndicated articles, guest blogs, news articles, etc.) that contain links back to your website, you should tag these links with UTM parameters. This allows you to track if this content drives users to your website and if the traffic leads to any conversions. There are even ways to use UTM codes to track offline efforts. This can be done by setting up vanity URLs that redirect to a UTM tagged URL. This is not an exact science and there is no way to guarantee that someone seeing your offline ad will not circumvent your vanity URL and go directly to your site, but it can potentially give you added insight you would have not otherwise had. How to set up UTM tracking? Fortunately, Google makes it pretty easy to set up UTM tracking for your URLs. They have a URL Builder tool that does the hard work for you! All you need to do is plug in your URL and your parameters and Google will spit out a tagged up URL. It even now has a URL shortener to make the long, unsightly URLs slightly less ugly. Below is a screenshot of what the URL Builder looks like. Now that you know what UTM tracking is, when to use it and how to set it up. What are the parameters and how should you use them? There are 5 parameters that can be used when setting up UTM codes. Campaign Source – This is a required field. The source should be used to identify the platform or vendor where the link is placed. Examples would be Facebook, Newsletter, a specific site name, etc. Campaign Medium – This is used to be a required field, but Google has recently changed it to not required. We highly recommend that you use this field for every tagged URL. Medium is the broadest field and is used to describe the type of placement. Examples of this would be CPC, Banner, Email, etc. Campaign Name – This also used to be a required field, but is no longer required. Campaign name is used to identify your campaign. Examples of campaign names might be November newsletter or holiday sale. Campaign Term – This field is mainly used for tracking keywords in paid search campaigns, it may also be used in display campaigns to identify different aspects of your audience. Campaign Content – This field can be used to differentiate ads that are pointing to the same URL. This can be used for A/B testing ad variations, identifying different ad sizes or differentiating links in different locations within the same source, medium and campaign. Finally, some best practices for using UTM tracking. 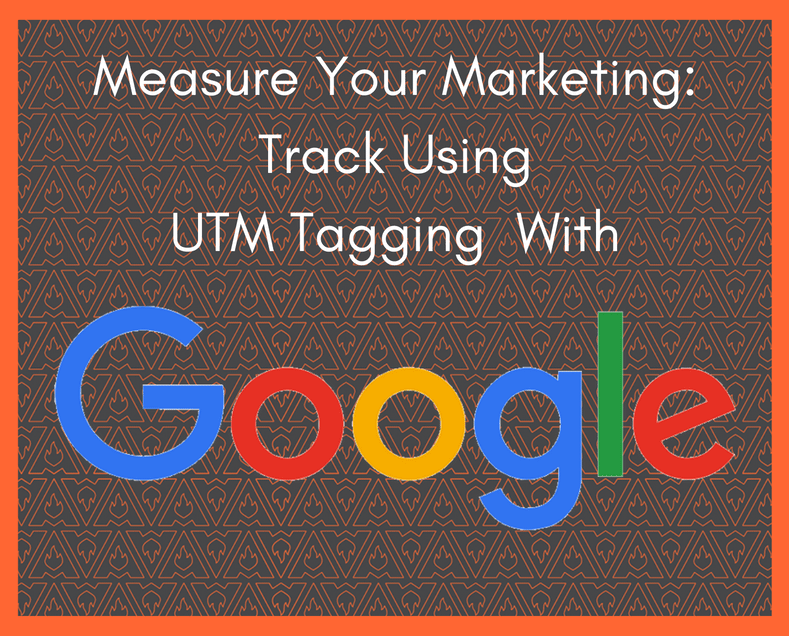 UTM tracking can be an extremely useful tool, but it is important that you are using it correctly and effectively in order to get the most out of the additional data you will receive. When you have the same source and/or medium across multiple campaigns, these should all match exactly, i.e don’t use “cpc” for one campaign and “paid” or “cost-pe-click” for another campaign. Consider creating a UTM naming convention guide to ensure all team members are following best practices. Keep track of your UTMs. Use a spreadsheet to keep track of all of your UTMs for every campaign. This way you have a historical reference of the UTMs you have used and also to ensure you continue to use the same naming conventions for future campaigns. Make your UTMs descriptive. You don’t want there to be any confusion when reviewing the results of your campaigns in Analytics. UTMs should be very clear and concise and should tell the full story of the link, for example: this traffic came from a Facebook (source), PPC (medium) ad for our winter sale (campaign name) and targeted parents (campaign term) with the ad version a (campaign content). UTM tagged URLs are not very pretty, when you can we recommend using URL shorteners (like Google’s tool, which is also built into their URL builder, or Bitly) or hyperlinks when possible. Additionally, as mentioned above, for off-line efforts you can set up vanity URLs that redirect to a UTM tagged URL. If you want to see only your non-Adwords campaigns, you can use an advanced filter to exclude data from the Source/Medium “google/cpc.” See the example below. 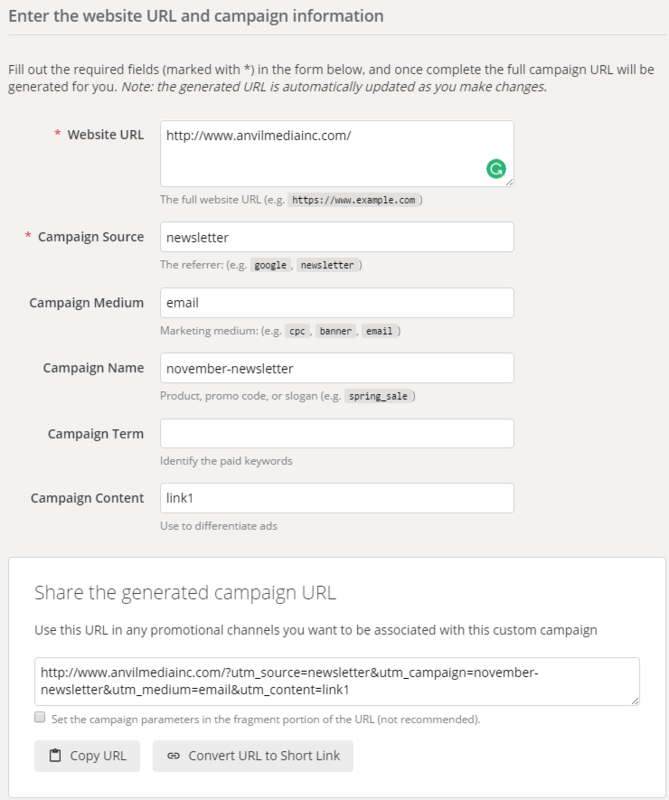 If you are using additional UTM parameters of “term” and “content,” you can click on the specific campaign name in the Acquisition>Campaigns>All Campaigns report that you want to look at and add the secondary dimension of either ad content or search term, depending on which parameter you wish to compare. Below we are comparing the links within an email campaign. UTM tracking is a powerful tool if used correctly, but it is not flawless. If your UTM tagged URL is shared from different platforms, say someone shares the link (that has been tagged) from your newsletter to Facebook, then Analytics will show that the traffic came from your newsletter, even though technically that traffic came from Facebook. It isn’t a perfect science, but it does allow you more in-depth understanding of how users are coming to your site from your marketing efforts than you would have had otherwise.